Steam traps that utilize the difference in the thermodynamic properties of condensate and steam. Extremely versatile disc-type steam traps. The operation principle for these traps utilizes the difference in the thermodynamic properties of condensate and steam. Disc-type traps and impulse-type traps are both examples of steam traps belonging to this classification. 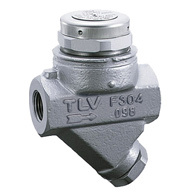 TLV’s thermodynamic steam traps are all disc-type traps, which allow less steam leakage and have fewer problems with scale and build-up of dirt. Suitable for a variety of applications, such a steam main lines, tracers, steam heating equipment, etc.